Original publication date: Sunday September 19, 2004. A protein complex named Photosystem I, which is derived from spinach chloroplasts, functions as an extremely small electronic circuit. About 100,000 of them would fit on the head of a pin. Baldo and other researchers from MIT, the University of Tennessee and the U.S. Naval Research Laboratory, including electrical and biomedical engineers, nanotechnology experts and biologists, collaborated on the world’s first solid-state photosynthetic solar cell. 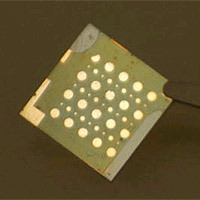 The work was reported in NanoLetters, a publication of the American Chemical Society. “We have crossed the first hurdle of successfully integrating a photosynthetic protein molecular complex with a solid-state electronic device,” Baldo said. Plants’ ability to generate energy has been optimized by evolution, so a spinach plant is extremely efficient, churning out a lot of energy relative to its size and weight. But combining biological and non-biological materials in one device has stymied researchers in the past. Biological materials need water and salt to survive—both are deadly for electronics. A new twist in the current work is a membrane of peptide surfactants—similar to the main ingredient in soap—that helped the photosynthetic complexes self-assemble and stabilize while the circuit was fabricated. So far, scientists and engineers’ efforts to harness the photosynthetic properties of green plants have been most successful with naturally soft organic materials in liquid solutions. But if organic solar cells are to be practical for commercial devices, they need to be integrated with solid-state electronics. The researchers ground up ordinary spinach and purified it with a centrifuge to isolate a protein deep within the cell. The resulting dark green pellets that smell like cut grass were purified still further and coaxed into a water-soluble state. One of the challenges was to keep the proteins in the same configuration as they appear naturally in the organism. Here’s where peptides come in. The 80,000-plus kinds of proteins in our body, when in fragments called peptides, transform themselves like tiny LEGOs™ into millions of substances. Shuguang Zhang, associate director of MIT’s Center for Biomedical Engineering, discovered that these same peptides can be tweaked into forming completely new natural materials that perform useful functions. One of his designer nanomaterials, which acts like the main ingredient in soaps and detergents, turns out to be ideal for keeping protein complexes functional on a cold, hard surface. The spinach-sandwich device has no water. Proteins usually need water to survive, but using Zhang’s detergent peptide, the researchers were able to stabilize the protein complexes in a dry environment for at least three weeks. “Detergent peptide turned out to be a wonderful material to keep proteins intact on the surface with electronics,” Zhang said. He speculates that the detergent material has some water trapped within it, similar to the way plant seeds hoard oils that maintain the seeds’ integrity in dry conditions. The bottom layer of the molecular electronic device is transparent glass coated with a conductive material. A thin layer of gold helps the chemical reaction that assembles the spinach chlorophyll Photosystem I complexes. The researchers then evaporate a soft organic semiconductor that prevents electrical shorts and protects the protein complexes from the layer of metal that completes the sandwich. The researchers hope to achieve a power conversion efficiency of 20 percent or more (which would provide an extremely efficient power source) by creating multiple layers of PSI or assembling them on rough surfaces or 3-D surfaces, like skyscrapers that concentrate a huge amount of surface area within a relatively small space. Patrick J. Kiley (S.B. 2003) of MIT also worked on this research, which is funded by the Defense Advanced Research Projects Agency, the Air Force Office of Scientific Research, and the National Science Foundation.